Gasoline is a petroleum liquid product which is primarily used in internal combustion engines (cars). 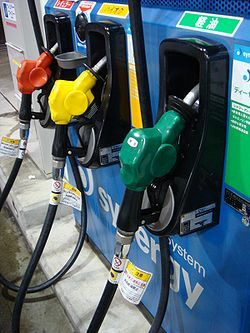 The color of gasoline jar is a transparent yellow- green color. In a gas stations parking lots, there are often effervescent colored spots on the asphalt. Most people think that it is an oil stain from a car, but most often it is a gas leak. Gasoline and a very flammable product and when it comes in contact with the skin it will burn and absorb into the flesh it can cause cancer. When gasoline touches the eye, the contact to eyes will become completely blind. Gasoline is not a natural element such as sodium or copper and cannot be mined or found in an ore but it is a natural by-product of petroleum made from crude oil. Crude oil is drilled in many parts of the world like Alaska, The Gulf of Mexico, and the Middle East. Once the crude oil has been drilled it is sent in barrels to oil refineries across the world. In the refinery the oil is converted to diesel fuel and gasoline by a process called distillation. The material that is separated for the oil is called straight- run gasoline. In the nineteenth century the fuels for cars and other automobiles were coal tar distillates and a lighter form of distilled crude oil. On September 6, 1892 the first gasoline powered tractor was made by a man named John Floelich from Iowa. This tractor had one vertical single- cylinder mounted to a wooden beam and could drive a J.I. Case threshing machine. In the winter of 1918 the first U.S. made gasoline pipeline started to transport gasoline through a three inch pipe over 40 miles long from Salt Creek to Casper, Wyoming. Then in 1990, the Clean Air Act came into effect. This act was created to eliminate pollution all together and changed the gasoline making process forever. When the automobile started to become the number one mode of transportation, the need for new fuels was raised. In the nineteenth century, gas, kerosene and coal were being used as fuels for cars and in lamps. The car engine required a fuel with a petroleum base. As the higher the demand for cars went, the more gas was needed to fuel these automobiles. Although the oil refineries were going as fast as they could to make enough gas for everyone, they could not go as fast as the cars coming of the assembly line. The three most popular oil/gas companies in the world today are British Petroleum, Shell, and Chevron. These three companies also owns smaller gas companies like Texaco, Harris and the store brands like Costco, 7-Eleven, Safeway and Fred Myers. Gasoline has three major problems, one having to do with smog and the ozone layer and the release of carbon and greenhouse gasses. 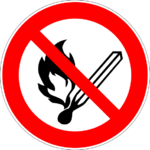 When gasoline is burned by itself, carbon monoxide and water is in the exhaust that is given off. When gasoline is burned in an internal combustion engine, a regular car engine, carbon monoxide, nitrogen oxides and unburned hydrocarbons are produced. These noxious chemicals are released into the air and cause the detraining ozone layer. When carbon is burned it turns into carbon monoxide. Since gasoline's weight is in carbon, for every one gallon of gasoline burned, five to six pounds of carbon monoxide is produced. In the U.S. alone roughly two billion pounds of carbon monoxide is released into the air every day. The carbon monoxide that is released into the air is also a greenhouse gas. A greenhouse gas is any atmospheric gas that contributes to the greenhouse effect by absorbing infrared radiation produced by solar warming of the Earth's surface. The ultimate effects of the greenhouse effect are rising sea levels and flooding. For these reasons there are growing efforts to replace the use of gasoline with hydrogen. The third reason being that gasoline of extremely flammable. ↑ 1.0 1.1 Oil Providing Energy for Progress. Chevron.com, Unknown Publisher, Late Accessed April 7, 2011. ↑ History of Gasoline About.com Inventors, Unknown Publisher, Last Accessed February 17, 2011 . ↑ Gasoline Wikipedia.com, Unknown Publisher, Last Accessed March 30, 2011. ↑ Oil to Gasoline Newton Ask A Scientist, Unknown Publisher, Late Accessed March 30, 2011. ↑ 5.0 5.1 History of Gasoline About.com, Unknown Publisher, Late Accessed March 30, 2011. ↑ Who we Are Shell, Shell, Late Accessed May 22, 2011. ↑ BP Amoco/ARCO Merger Summary Unknown Author, Unknown Publisher, Late Accessed March 30, 2011. ↑ Benefits of Chevron With Techron Benefits of Chevron With Techron, Unknown Publisher, Late Accessed April 7, 2011. ↑ Dictionary.com Dictionary.com , unknown Publisher, Late Accessed April 7, 2011. ↑ How Stuff Works "How Gasoline Works" HowStuffWorks, Inc., unknown Publisher, Late Accested March 30, 2011. This page was last modified on 22 April 2015, at 13:10.